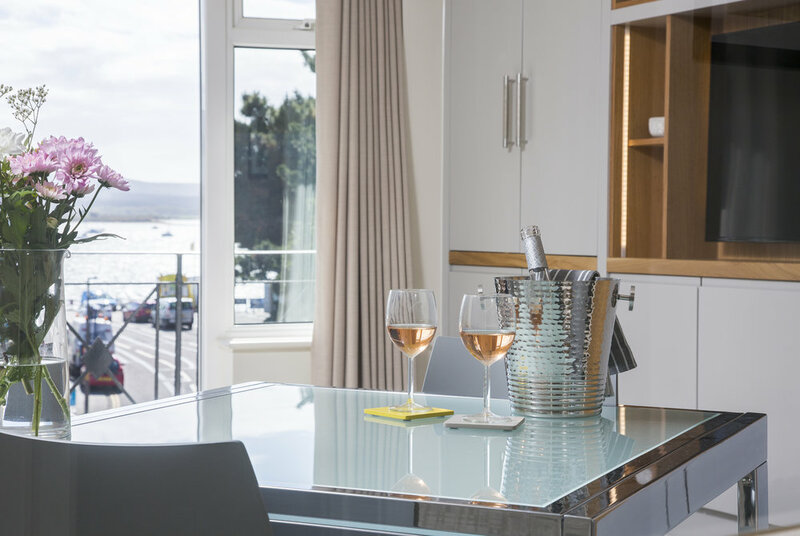 A beautifully furnished 2-bedroom seaside apartment on the world-famous Sandbanks Peninsula of the iconic Jurassic coast. Just a short walk from the famous golden sands and breathtaking views of ‘Blue Flag’ award-winning Sandbanks Beach. 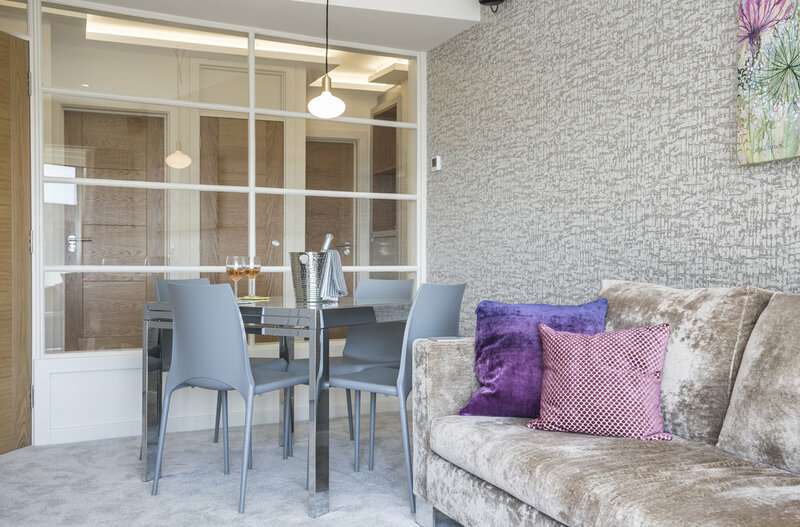 Haven Court is a tranquil newly renovated two-bedroom top-floor apartment situated in a small block of five apartments set over two floors. The delightful complex comprises communal gardens, thoughtfully landscaped and meticulously well-kept. There is ample on-site free parking and a garage is available for bicycle storage. The interior of the apartment has very recently been completely remodelled by Design'd Living, visionary interior designers whose exceptional eye for detail and exquisite practical designs create the perfect ambiance, affording The Lookout a highly stylish, contemporary look and feel and a very clever use of space. From atmospheric mood lighting and underfloor heating throughout to the newly laid Karndean flooring and plush carpeting, our guests are assured of a very warm welcome indeed. The brand-new fully fitted kitchen incorporates all the usual appliances and is very well equipped, including integrated washing machine/dryer, dishwasher, fridge freezer and microwave oven. With an electric hob and oven, overhead extractor fan, Belfast sink unit, Quartz work surfaces, and small dining table/chairs, it is creatively designed as well as highly practical. The lounge/dining room has been refurbished to a very high standard. Unwind and relax on the gorgeous Italian sofa with its copious plump cushions. Beautiful floor-to-ceiling cabinets house the flat-screen TV and Sonos music system. An extendable table (8) and four Ligne Roset dining chairs are provided. This charming reception room gives onto a small balcony which is complete with garden furniture and views over to Studland and the ferry. An ideal spot to sip a glass of wine and watch the world go by after a long day at the beach. The master bedroom has been refurbished for maximum comfort and charm. Tastefully decorated with its soft honey tones, the super king-size deluxe bed with its crisp white linen is designed to induce an exceptional night’s sleep. Electric curtains, handcrafted fitted wardrobes, flat-screen TV, and a stunning back headboard running the entire width of the room complete this room’s contemporary vibe. The guest room has been cleverly configured with a custom-made double bed for an adult couple or three beds for children. Tailor-made stairs leading to the top bunk add a touch of exclusivity for that particular bed’s occupant or a great place to hide away and take some precious ‘me time’. And a wall-mounted flat-screen TV and a variety of games combine to make this room a favourite for children. There is plenty of hanging and storage space available. An all-purpose desk area awaits should work or study deign to intervene, and complimentary Wifi is available throughout. 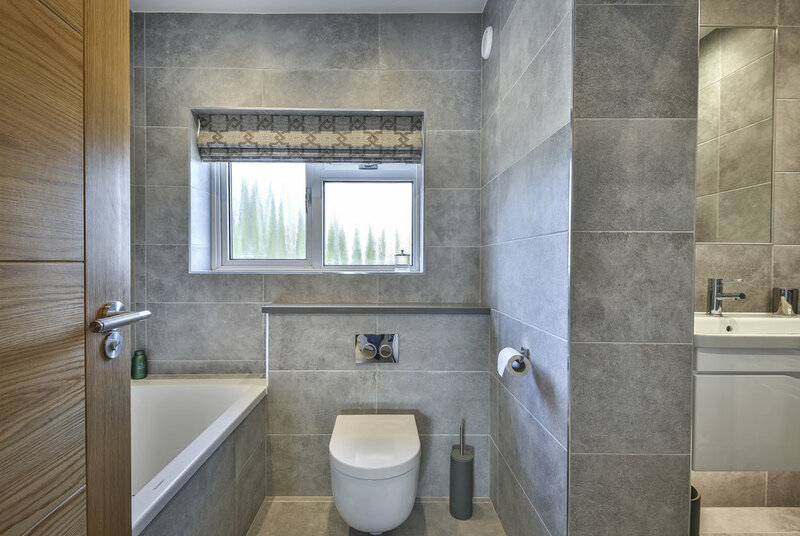 The bathroom, separate shower and (2) toilets are very contemporary and designed to an exceptionally high standard. Beautifully ornate mosaic tiles set against calming grey stone in the bathroom help to create a relaxing environment in which to bathe and unwind. And simple but creative personal touches feature throughout this delightful apartment. Tasteful wall pictures, crisp white linen, plump cushions, bathrobes for the master bedroom, and an abundance of wonderfully soft towels are provided. All designed to create the perfect ambiance and ensure your stay is an idyllic one.